"They dance around the horse..."
Man, I have been busy. Let me tell you! On September 18th there was a huge event in Kumamoto called the Fujisaki Hachimangu Festival (藤崎八旛宮秋季例大祭) where there is a parade of horses numbered up to 67. The people dance and yell, “dookai, dookai! (How’s this?! How’s this?! 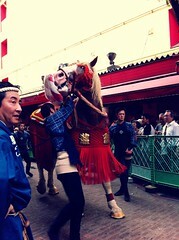 )” around the horse, following it, and playing instruments–the entire festival is full of energy. At one time they would give the horses alcohol and get them completely drunk, and I have also heard that they would cut off the horses head at the end, but I’m not sure how true that statement is. The fact of the matter is it was a blast. Despite the detest for the festival some of my coworkers had due to the previous mistreatment of the animals, I had a great time. I can’t say without a doubt that they were not given alcohol and that they were all treated well, but not a single one of them was forced into running or forcibly spooked in front of me. There were a few times that a horse got a little agitated and uncomfortable with it’s surroundings but there was no one there beside or around the horse trying to instigate a situation where the horse might get out of control. I wasn’t the only one enjoying my time at the festival–many people were there enjoying the entertainment and every person in the parade was dancing and singing/yelling and having a wonderful time. Many of the people who took part in the festival were very friendly, came up to my video camera and waved, or struck a pose. The horses may not have been given alcohol (at least the times when I saw them give the horses anything it was water, but the people of age in the festival were enjoying theirs. They would pour the remainder of the water on the horse when the horse had it’s fill and none of it smelled of sake or any sort of alcohol. Each number (there were 67) had different colors, lead by a horse and a man on a moving cart with a megaphone/speakers cheering on their group and filling them with energy. So many people dressed up in costume or strange makeup. 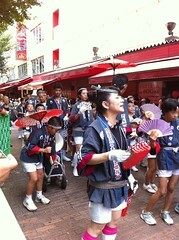 Even the children took part in the event, even if by the end someone was carrying them. The festival took up the entire day. There was still a portion of the parade left by 10pm that night; and to think I wanted to stick it out until the end desperately. I didn’t have that kind of time. I threw in the towel around the 30th horse or so. "The trees toward Kumamoto Castle were littered with lanterns..."
On the 22nd a friend from Osaka came to visit me and it was great fun. My only regret is that we didn’t have the time to show him everything he would have preferred to see. Hopefully I will have another shot at showing him more of Kumamoto and the surrounding area in the future. On the second and last day of his stay here we began by going to Kumamoto Castle. 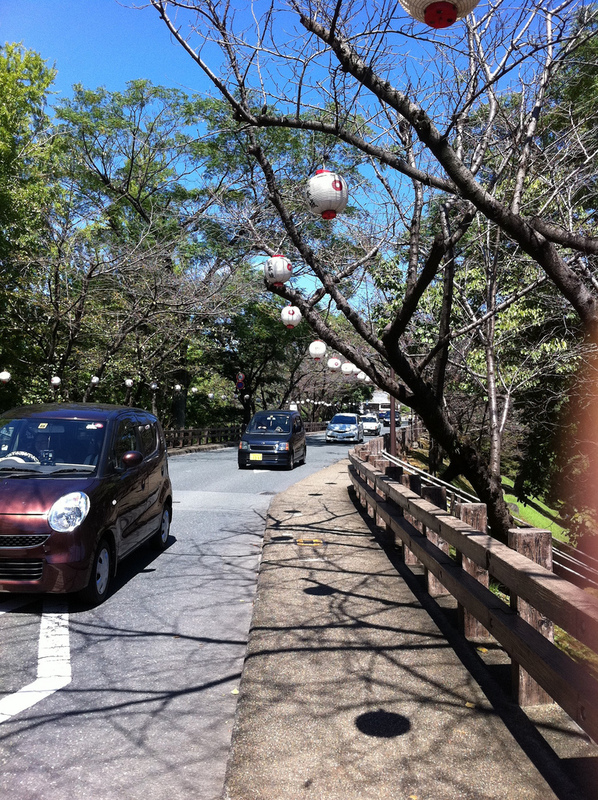 On our way up, the trees by the sidewalk leading up to Kumamoto Castle were littered with lanterns. I don’t believe I have ever seen them lit up at night, so I wonder if they are only lit for certain events or if they are just for show and have no candle/light inside. The road was narrow so walking side by side to talk to one another was very difficult to do as many people were on their way down. Afterward we went to a wonderful ramen shop where we tasted the deliciousness of Kumamoto ramen, which was very good. I’m sure there are better and more expensive shops out there, but I must say that I did really enjoy what I ordered. A little recent fact about me is that I have been dieting recently in attempt to lose some weight that I have put on over the years, and the past few days I allowed my diet to be thrown out the window for a while so that I could enjoy and partake in many delicious food. For example, the previous night, I ate cooked horse meat and heart! It was delicious–both of it. I was skeptical about the horse heart at first but I faced my worries and ate it. It was soft and delectable. It practically melted in your mouth. "Both Byung and I took part in drinking the water at Suizenji..."
From the ramen shop Byung and I quickly made a break for Suizenji Koen. This was a first time visit for me as well. I have been in Kumamoto for about half a year and it’s one of the places in this city I had yet to go to. I’m glad I finally went. The park was beautiful. I was expecting it to be a little more barren and with a lot less people–so many people made it out to sound as though it was some boring experience; but it was far from that. There were children down by the pond feeding the koi fish who were trying to shove themselves up onto the shallow rocks in attempt to gulp up some pieces of bread people were tossing down. I have never seen such a mob of koi fish before. There was a crane standing upon a rock, looking at me with hollow eyes as though he knew I was not even remotely a threat–or perhaps he thought he could beat me up if I tried. The shrines (神社) were amazing. 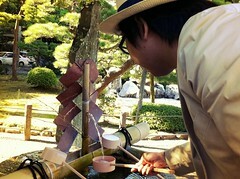 There was an area where you could drink the water of Suizenji which was said to help give you a long life. Both Byung and I took part in drinking the water and I was again reminded how delicious Kumamoto water is. Before we knew it the time had already passed and it was time to get Byung back to Kumamoto Station so he could catch a bus to the airport to head back home to Osaka. I had a great time and I’m really happy I was able to see him. The silly, but fortunate, part is that this coming weekend I will be going to Osaka. At first I was a little hesitant about the idea and I wasn’t sure how much I liked the idea of going, but after I booked my overnight bus there and back I began feeling a little more excited about it. I can’t wait to go and see Kazu and Byung again. It’s really been a long time since I have been to Osaka and I feel a little giddy about seeing the city again. It’s what showed me how much I loved Japan in the first place. I guess a part of me is hoping that it still is the same.